Eating my colors makes me happy. Combining tasty food with colorful piles of vegetables is a terrific way to eat a variety of colors. 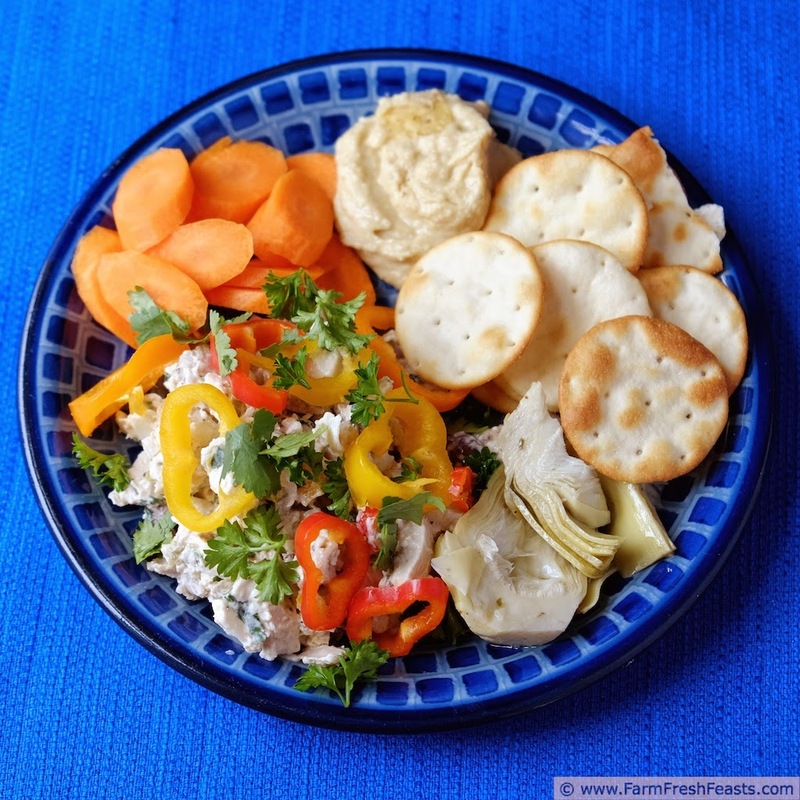 I wouldn't normally say that chicken salad is a colorful dish, but when you serve it with gorgeous vegetables, well, even on a white plate this would still be a riot of color. I've been throwing together some easy summer mixed plates using a variety of cool and warm ingredients lately. For a glimpse, head to my FB page to check out this photo. 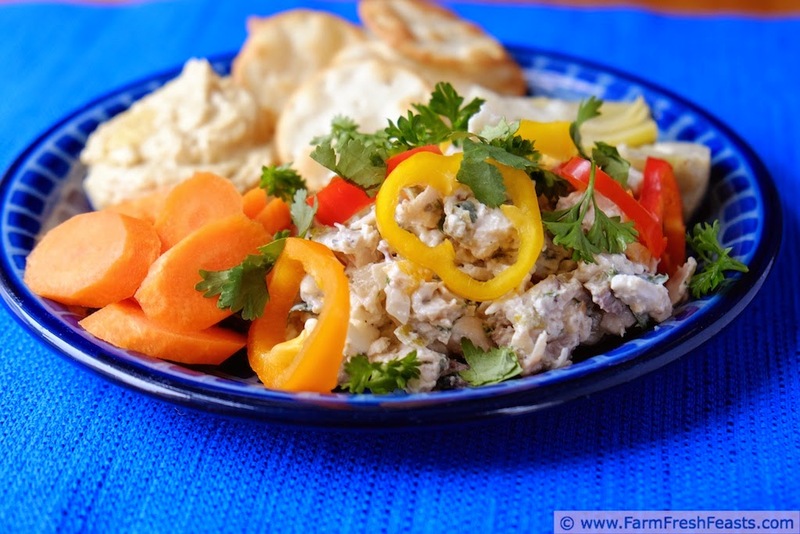 Use whatever vegetables are available, in season, to serve this chicken salad. Currently my pepper plants are overshadowed by the rogue squash that decided to live in their garden bed, I have carrots, kohlrabi and squash in the farm share, and local cucumbers down the street. Each week brings new crops into ripeness so this same salad will continue to adapt to the available colors. [Just watch out for the beets, or you'll have the "wow, I must be dying . . . oh, wait, I ate beets yesterday" experience]. 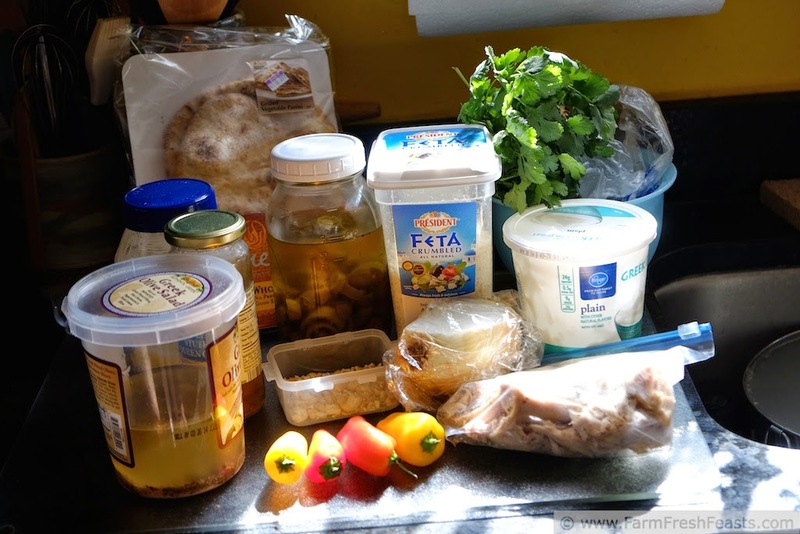 Combine yogurt, mayonnaise, and spices in a large bowl. 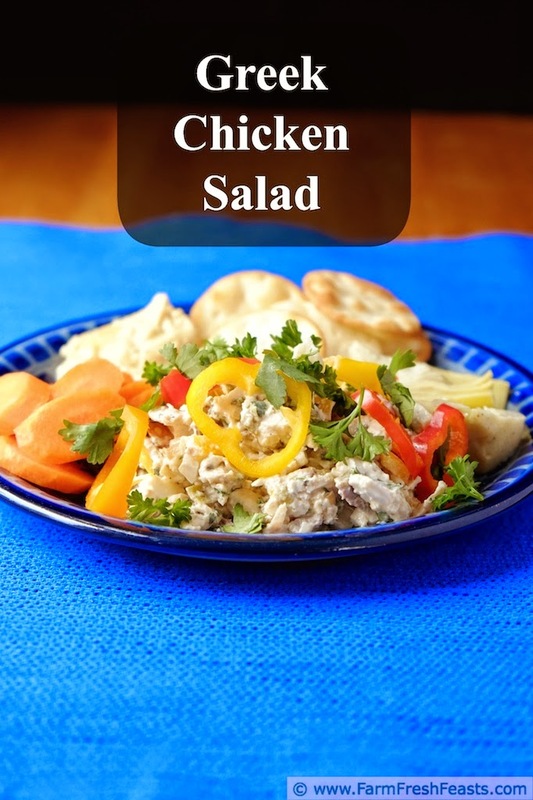 Dump vegetables, cheese, chicken and herbs, and stir to coat with dressing. Sprinkle nuts on top. Serve alongside, over top or mixed in with optional veggies and hummus. Garnish with crumbled pita chips if desired. I love to grill a bunch of chicken breasts and keep them on hand to pull together salads like this. Now that we're grilling more often, I need to try this--I keep planning the vegetables for the grill, but the meat is kind of an afterthought. Last night it was bratwurst patties (that grill from frozen) and shrimp (that thawed easily) with yellow squash 2 ways and new potatoes. Always with the vegetables, my mind is during the CSA season. P.S. I've had the oh my god, I'm dying...oh wait it's just beets experience before. Makes things interesting. I have these Costco chips because of YOUR Costco chips! I'd been buying the giant bag, and while they taste yummy they are kinda hard and crunchy and I didn't want anyone to ruin their new orthodontia, if you know what I mean. So I started buying the box of pita chips and I love the way I can make individual appetizers out of them as well as scoop up piles of veggies. So thank you for that WIAW tip!